RADAR CHECK: We have random, scattered showers and thunderstorms across Alabama this afternoon. They are small and drifting to the west. 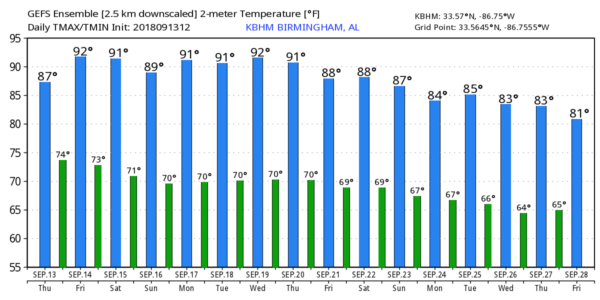 Otherwise, the sky features a mix of sun and clouds across Alabama with temperatures mostly in the mid to upper 80s. Showers and storms will end tonight after sunset. FRIDAY AND THE WEEKEND: We will be in sinking air on the far periphery of the circulation of Hurricane Florence. Look for mostly sunny, hot days and fair nights; afternoon showers will be very isolated. Highs will be between 90 and 93. It will feel more like August than September. NEXT WEEK: Not much change; the first half of the week will be hot and mostly dry. We could see a few scattered showers and storms by Thursday and Friday with a front approaching from the north. Alabama will see no rain as a result of Hurricane Florence. 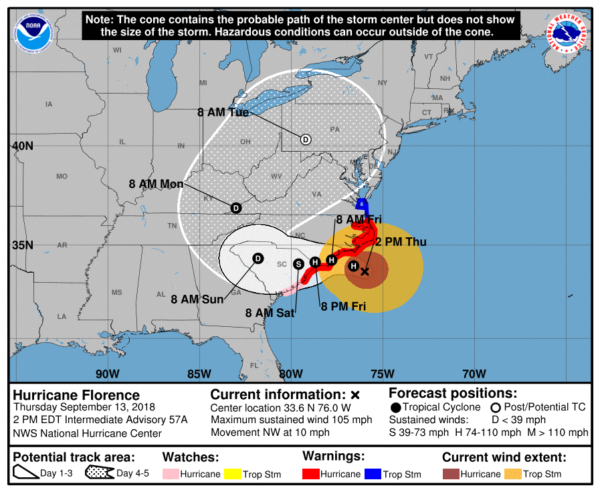 FLORENCE: Florence is packing sustained winds of 105 mph this afternoon and is very near the southern coast of North Carolina. The system is slowing to a crawl, and will move little over the next 24 hours. This will result in an extended period of battering waves, fierce tropical rain and unrelenting wind. A life-threatening storm surge is now highly likely along portions of the coastlines of South Carolina and North Carolina, and a Storm Surge Warning is in effect for a portion of this area. The greatest storm surge inundation is expected between Cape Fear and Cape Hatteras, including the Neuse and Pamlico Rivers and western Pamlico Sound. Life-threatening, catastrophic flash flooding and prolonged significant river flooding are likely over portions of the Carolinas and the southern and central Appalachians through early next week, since Florence is expected to slow down as it approaches the coast and moves inland. 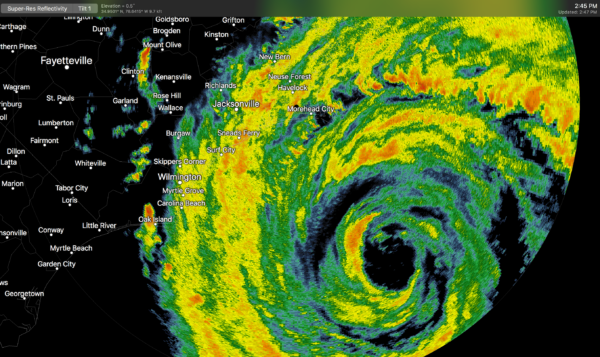 Damaging hurricane-force winds are likely along portions of the coasts of South Carolina and North Carolina as soon as this evening, and a Hurricane Warning is in effect. Strong winds could also spread inland into portions of the Carolinas. Large swells affecting Bermuda, portions of the U.S. East Coast, and the northwestern and central Bahamas will continue this week, resulting in life-threatening surf and rip currents. INVEST 95L: This wave will bring lots of rain to south Texas Friday and Saturday; there’s still an outside chance it becomes a tropical depression before it moves inland. ISAAC: Tropical Storm Isaac is in the eastern Caribbean and is very disorganized, with winds of 45 mph. If it survives, it will move across the Caribbean over the weekend, most likely weakening to a tropical depression by Sunday or Monday. HELENE/JOYCE: These systems are in the far eastern Atlantic and will not get anywhere near North America. ON THIS DATE IN 2008: Hurricane Ike made landfall at Galveston, Texas. Ike was blamed for at least 195 deaths. Of these deaths, 74 were in Haiti, which was already trying to recover from the impact of three storms (Fay, Gustav and Hanna) that had made landfall the same year. Seven people were killed in Cuba by Ike. In the United States, 113 people were reported killed, directly or indirectly. Because of its immense size, Ike caused devastation from the Louisiana coastline all the way to the Kenedy County region near Corpus Christi, Texas. In addition, Ike caused flooding and significant damage along the Mississippi coastline and the Florida Panhandle. Damages from Ike in U.S. coastal and inland areas are estimated at $30 billion.